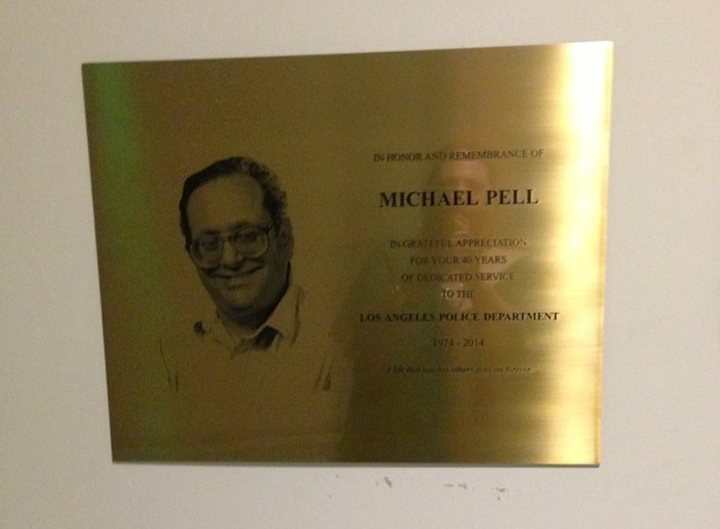 Michael Pell’s LAPD in memoriam poster. The Los Angeles Police Department renamed its Headquarters mailroom for Michael Pell in a ceremony on June 19. Pell, a LASFS member who passed away unexpectedly on February 6, was employed as a clerk in the LAPD’s Records & Identification for nearly four decades. 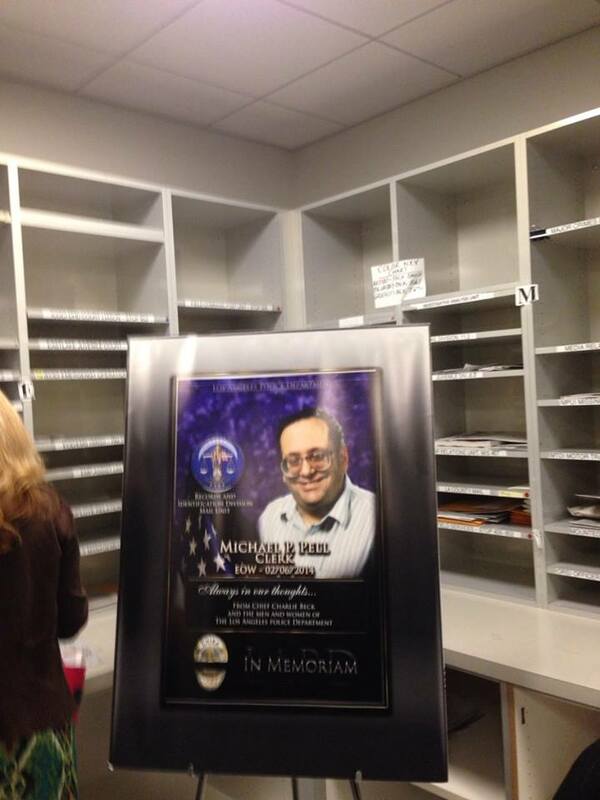 He was loved very much by his co-workers and they named the mail room after him. 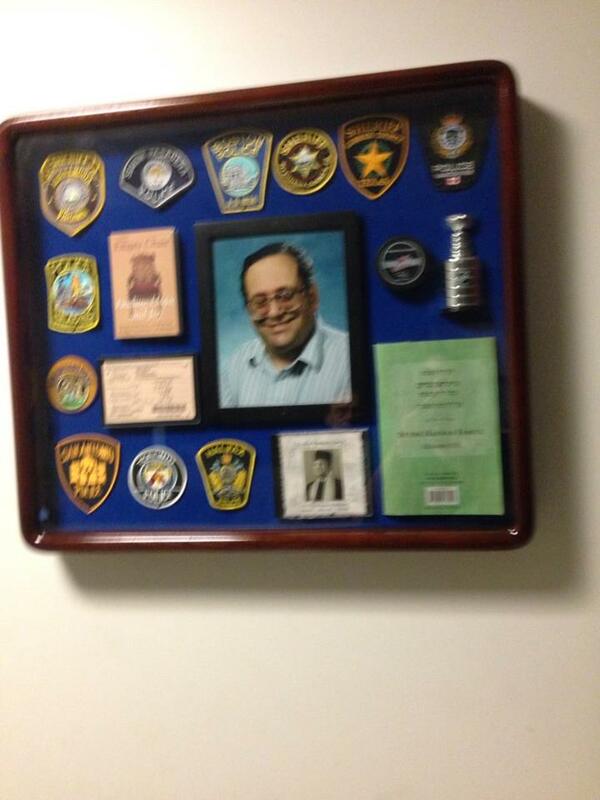 The bronze plaque is on the wall outside the room and the shadow box was created by his coworkers to show some of his interests. The other picture is a poster of Michael. I have a larger version of this that was presented to me and autographed by Chief Beck. I want to thank all of his coworkers for their love and caring of Michael. I’d like to express my heartfelt sorrow for the unexpected loss of an unsung hero, Clerk Michael Pell, Serial No. A8825. After holding clerk positions in the United States Post Office and County USC Hospital, Michael Pell,was hired by the Los Angeles Police Department on November 22, 1974, as an Office Trainee assigned to the Records & Identification Division’s Arrest Disposition Unit at the age of 25. He was appointed to the position of Clerk two years later and was assigned to the Department’s Mail Room, where he remained working until his passing, on February 6, 2014. For almost 40 years, Michael ensured that the members of this Department received their mail on time and their packages were delivered. He was the go-to person to track down previous incarnations of Department entities renamed during various reorganizations. 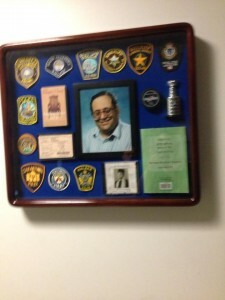 Michael epitomized personalized service, finding common interests with his customers, swapping news tidbits and anecdotes and sharing his interests in the Jewish religion, collecting law enforcement patches, hockey, and ComicCon events. His coworkers describe him best, as a “fan of life.” He truly loved his job and his Records and Identification Division family, as evidenced by many years of perfect attendance, and his refusal to even discuss the possibility of retiring. It is safe to say that Michael is an LAPD icon, familiar to many, and loved by all. He will truly be missed. Pell would write to law enforcement all over the world and ask for uniform patches.